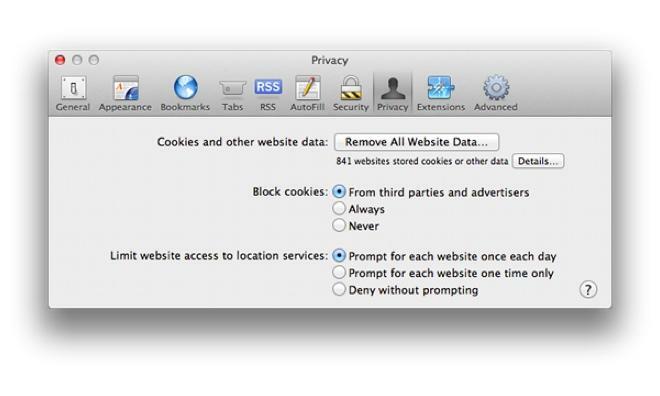 A Delaware judge has dismissed a class-action lawsuit filed by users of Apple's Safari browser, finding that the plaintiffs could not prove that the search giant had caused any real harm when it circumvented Apple's security measures in order to store cookies in the browser. Attorneys for Matthew Soble filed suit against Google in February of last year, claiming that Google knowingly sidestepped Safari's built-in privacy settings in order to track users' web activities. The suit came after it was revealed that Google and at least three other web ad networks had placed code into their ads that disguised them as user-initiated form submissions, thereby keeping Safari from blocking cookies from those ads, as the browser does by default. Now Soble's suit has been struck down by Delaware's Judge Sue Robinson, who ruled [PDF] that the plaintiffs had not sufficiently demonstrated direct harm to them stemming from Google's actions. The plaintiffs had not "shown a loss of money or property from Google's actions," Robinson's opinion read. The personal information collected due to Google's circumvention of Safari's protections, "does not constitute property" according to the ruling. The ruling looked at the case through the prism of several laws regarding electronic communications, including the Electronic Communications Privacy Act, the California Consumers Legal Remedies Act, The California Computer Crime Law, and The Computer Fraud and Abuse Act, among others. In not a single case did Robinson find Google's activities to be in violation of standing law with regard to the plaintiff's allegations. While Soble's case was dismissed, Google has already seen discipline from other governing bodies. The Federal Trade Commission slapped the search giant with its largest fine in history over the cookie issue. The FTC called for Google to pay $22.5 million, but the regulatory body allowed Google to deny liability for its actions. Google all along has maintained that it did nothing wrong. In a statement to AppleInsider, the company said that its actions were meant to allow users of Google services such as Google+ to have access to aspects of those services across the sites they visited. "However," Google continued, "the Safari browser contained functionality that then enabled Google advertising cookies to be set on the browser. We didn't anticipate that this would happen... It's important to stress that, just as on other browsers, these advertising cookies do not collect personal information."